Blog 2014 - Check Out the Integration between the ProQuest Platform and Flow™! Check Out the Integration between the ProQuest Platform and Flow™! If you didn’t see the news a few weeks ago, we announced that together, the ProQuest platform and Flow™ are beginning to deliver a more streamlined research experience, further supporting end-to-end researcher workflows by bringing together ProQuest databases and research document management. To summarize, the Save to Flow button was added to the action menu bar within the ProQuest platform, as well as a Flow option appearing in the Export/Save drop-down selection from the menu bar. This first release lets users save full-text PDF and full-text HTML documents to Flow, along with their bibliographic metadata. • The ProQuest platform supports many information and document management tools to serve researchers with a wide range of experiences and needs; Flow just happens to be the latest tool the platform will now support. • We will continue to support both RefWorks and Flow. In fact RefWorks users can continue to save documents as they have been. RefWorks continues to be sold and supported by our development teams. 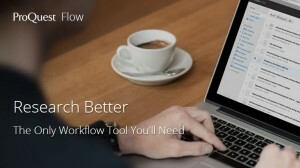 • Flow is fully supported by the ProQuest platform but in beta status, meaning that the connectivity of Flow and the platform is still under development with improvements to continue. We welcome feedback from our customers and users while using this initial integration. We will announce additional enhancements to this integration as they happen, but in the meantime, if you have questions – please contact us and we’ll be happy to answer them. Again, as this is a beta release, so feedback from you and your end users is encouraged. We believe this development will make the research experience more efficient and meet the high standards of quality you expect. If we're missing something, let us know!